"Once Upon A Time The Video Game At Sanders Associates..."
of David Winter and given to the Smithsonian through Ralph Baer himself. Click for complete scans. - Parts of this section were extracted by permission from Ralph Baer’s book about his long experience of father of the video game. 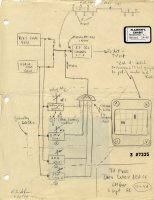 - Most of the original manuscripts of the video game invention, donated to the Smithsonian by David Winter via Ralph Baer, are now available in large scale on the Smithsonian site. Before video games, there were computer games. They used a cathode ray tube screen as display, but did not remotely resemble a home system generating video signals to display a game on a standard home TV set. Before 1966, computer games could only be played on exceedingly expensive mainframes. For example, Space War was played on PDP-1 machines. In 1966, Ralph Baer had the ingenious idea of playing interactive games on a home TV set, using a system that would generate video signals like those transmitted by a TV station so that they could be seen on n ordinary TV set. He called the concept "TV Games" at first, and later on, video games. He prusued his novel concept and the resultant game systems started an industry. Technically speaking, computer games could also not qualify as video games since they do not generate video signals, nor were their games displayed on a TV set. video games are built around computer technology. However, that was not possible in 1966, and Ralph Baer invented the system that did the job using low-cost electronic components available in the mid-sixties. More information about Ralph Baer’s involvement with video games can be found here. Ralph Baer is often called "Thomas Edison of the video game". In 1951, he worked at Loral, then a small electronics development and production company located in the Bronx. Sam Lackoff, his Chief Engineer, asked him to build the best television set in the world. Somewhere along the line, Ralph suggested that some novel feature might be included in the television receiver to distinguish it from the competition: adding some sort of "interactive game". That got the predictable negative reaction: "Forget it. Just build the damn TV set; it’s behind the schedule as it is". Nothing remotely similar to home video games happened for the next 15 years. During the summer of 1966, Ralph (who now ran a division at Sanders Associates in New Hampshire) found himself waiting for another Sanders engineer at a bus terminal. He took advantage of the free time and jotted down some notes on the subject of using ordinary home TV sets for the purpose of playing games. It was "Eureka" time, but of course he didn't know that yet. On the first of September 1966, he transcribed his notes into a 4-page Disclosure Document (pictured above, from the former collection of David Winter, and now at the Smithsonian). The document listed various types of games that he thought to be economically and technically feasible: action games, board games, sports games, chase games and others. The games would appear on either TV channel 3 or 4, which he called Channel LP for... Let’s Play. On September 6th, he drew an elementary schematic of a two-player game that he called a Chase Game. The game consisted of two squares (spots) that could be moved on the screen in both directions by two payers. The schematic also showed how to add color to the playing field. A few days later, he assigned a technician, Bob Tremblay, to the job of building up a vacuum tube circuit to prove that spots (player symbols) or bars could be easily displayed on a TV screen. To save time, Ralph bought a Heathkit IG-62 television receiver alignment generator, because it contained some of the circuits he needed for his experiment: sync generators, an RF oscillator that could be tuned to TV channels and an RF modulator, needed to place the game video signal on a Channel 3 or 4 RF carrier. This saved some time and cost. The reason why Ralph asked the technician to execute a vaccuum tube design was simple: he was familiar with vacuum tubes. Transistors were still relatively novel and he was not yet comfortable with designing them into television circuitry. Bob Tremblay finished the work in February 1967; it was now possible to move a single spot around the screen of the Black and White TV set used for the work so far. It was also possible to change the spot’s shape from square to rectangular or stretch it into lines of various lengths. Earlier, in December of 1966, Ralph decided that he should demonstrate his video game concept to Herbert Campman, the company’s Corporate Director and most likely source of funding. Now, the work involved in this project had nothing whatever to do with Sanders' normal activities because the company was exclusively engaged in the development of defense electronics. "I would like you to look at a demo of something new, Herb," he said. In the small room he had commandeered for the demo, Ralph showed the first playable video game: the Chase Game, consisting of two squares chasing each other. "This looks like it has potential", Herb Campman said, "but it better do more interesting things than this." Ralph sent him a memo on December 12th requesting some money to cary on the work. The first official R&D funding arrived: $2000 for direct labor and $500 for direct materials. Not exactly a princely sum, but enough to make the activity "honest" and keep the project going. During January 1967, Bob Solomon, an engineer in Ralph Baer’s division, Bob Tremblay and Ralph himself got together a number of times to come up with ideas for simple games, such as Chase games, "Bucket-Filling" and "Fireman" Games, Skill games and others, all of which were technically feasible with little more than the simple hardware they had assembled so far. They purchased an RCA color TV set for use during their ongoing experiments. Ralph designed some new circuitry for color display, with which the others were not familiar. In early February, Ralph figured it was time to get serious and sketched out some preliminary designs of a transistorised version of a basic TV game unit. On 12th, he brought Bill Harrison, another technician on-board the TV game project. Having worked with Bill Harrison on another project, a military crash program, Ralph really liked Harrison’s talents, so he commandeered him, and put him to working that small 10x20ft room of the 5th floor, where the first vacuum tube prototype had been designed. Bill started out by reviewing Bob Tremblay’s work, and Ralph trained him in television circuit fundamentals. Ralph also asked him to buy a cheap plastic toy pistol to design a light-gun for quiz games, a smart idea that still exists in modern video games ! When Bill got back with a small Japanese-made pistol, Ralph showed him how to design an optical "receiver" which he could point to the TV screen to pick up the presence or absence of bright spots on the screen. The immediate goal was to play multiple-choice games. Using the "gun" for shooting at targets came later. 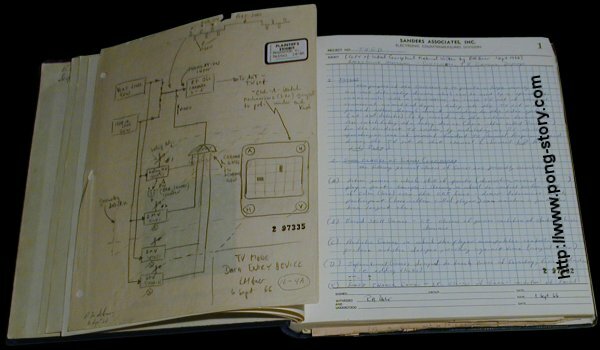 On May 2nd, Harrison, working on transistor circuits for TV games, designed a vertical scoring bar circuit as well as a chroma circuit for adding color, all of which were still tied to the RF modulator of the IG-62. The team could now split the screen and present two different colors below and above a variable horizontal line. That allowed playing the "famed" Pumping Game, which used a cut-out window and the firehose in an otherwise opaque overlay showing a fireman and a house. Game play consisted of having one participant try to raise the bottom, blue portion of the screen and the other to enlarge the upper, red portion of the screen. If the blue "water" was not pumped fast enough, the screen would turn red, showing the house "on fire" through the open cut-out and the game was over. Another game labelled "Bucket Filling" could also be played by two participants using two push-buttons: one would "pump" up water visible in a cutout of a bucket while the other would pump the waterdown. The first "pumping" contest between Baer and Harrison took place on May, 15th 1967. Harrison won handily. The next step was to get rid of the umbilical IG-62 and replace it with transistorized sync generators and an RF modulator and Channel 4 oscillator. Ralph, a TV engineer by degree, showed Bill how to do that. When all those circuits were working well, Bill mounted them into an aluminium chassis. This unit would see many additions and changes over the next several months. It became TV Game Unit #2, also referred to as the "Pump Unit". Among the changes and additions made to Unit 2, were a second spot generator and a coincidence detector circuit (operational on May 25th), which would hide one of the two spots when the other spot "touched" it. That brought a desirable bit of realism to the Chase game. Adding a random-noise generator designed by engineer John Mason and built by Bill Harrison on a separate board, could very rapidly change the location of a player spot. This resulted in multiple player spots on the screen and allowed playing a "Fox & Hounds" game: a red spot controlled by one player was the fox, and a number of white "hounds", controlled by the other player, chased that fox all over the screen. The players used both Horizontal and Vertical control knobs to move the fox and the hounds. The object of the game was to see how long the fox could evade the hounds before it came into contact with one of them and was wiped out. About that time, another light gun had been built by Bill Harrison. This time, the object of the game was shooting at a target spot on the screen and wipe it out. Reasonable good aim was required to accomplish when "shooting" a few feet distant from the screen. By mid June, operation of Unit 2 was sufficiently improved and problems cleaned up to the point that the team thought they were ready for a show-and-tell to senior management. They asked Herb Campman to come up to their small lab for a preliminary demonstration. Herb brought along Louis Etlinger, the Corporate Patent Counsel. That visit took place on the 14th of June. Herb played all the games, fired the gun from the shoulder and from the hip, all of which must have impressed him since more money was made availble to continue the project. Both Herb and Lou signed a statement to the effect that they played these games that day... building a legal track record ! Herb and Lou agreed that the team now had games with enough variety to venture a major demonstration to Sanders senior management. Word had gotten around in the upper reaches of the company that Baer was "screwing around" with some sort of TV gadgetry, so there was no choice but to demonstrate Unit 2 to the "big boss". Seven games were planned for the demo: A Chess game, a Steeple Chase game, a Fox-and-Hounds game, a Chase game, a Bucket Filling game and a Target Shooting game using the light gun. "We can't afford to blow this one, Bill," Ralph said. "Let’s make absolutely sure that we will not screw up this demo." Herb Campman told the team to expect Royden Sanders, the company’s president and Harold Pope, the executive VP of the company. The team also heard that another VP, Dan Chisholm, might be there, as well as Henry Argento and several other members of the Board of Directors who happened to be at the plant for a board-of-directors meeting on the day for which the demo was planned. 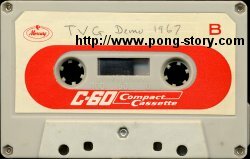 To make sure that all of the individual game demos would flow smoothly, Ralph recorded an audio tape on which verbally introduced each game before it was played. He also designed a simple TV sound modulation circuit which Bill built into the game unit so that the tape player’s sound would be played through through the speaker of the TV set. Another neat and novel touch: Video Games with voice-over game instructions ! Royden Sanders, Harold Pope as well as the entire Board of Directors showed up in June 15 for the demonstration. Unit 2 worked like a charm and everyone seemed impressed although there was more than one expression of doubt that Baer could make this project into a business. Henry Agento was probably the most enthusiastic of the board members. He really liked what he saw, and remained a faithful booster for years afterwards. Royden Sanders, the compnay’s president and Harold Pope, the Executive VP and Baer’s boss, conferred briefly and decided to let the team continue to develop additional games. Management’s edict now became: "Build something we can sell or license, and soon !" As a response to that, Ralph decided to concentrate on the development of a simple but interesting game unit that could be sold for twenty-five dollars at retail. This prompted the development of Unit 3. Unit 3 was a simplified version of Unit 2, which contained too many circuits, hence a too high cost. Bill Harrison also improved circuit designs. By September, he had built a smaller, 5x5x6 inch prototype box which played simple Chase and Light Gun games. The color circuits were abandoned to reduce the cost without affecting the play value of the game, though background color was added later. Also abandoned were the timer circuits and various other do-dads in Unit 2, such as a spinning color guessing wheel. 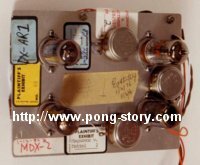 Unit 3 was also a modular design to simplify test and assembly in production: the two spot generators were assembled on two separate boards, an idea that was dropped in later prototypes, but revived by Magnavox in their Odyssey system. Once finished, Unit 3 was estimated to cost sixteen dollars, bad news for the prospects of selling a TV game at a reasonable retail price. Part of the cost problem was due to the fact that Baer and Harrison had no access to large quantity suppliers of electronic components. As it stood, there was no hope to have this game retailed at twenty-five dollars. Since there seemed to be no way to materially reduce the cost of what they had designed so far, the team clearly had to improve their prototype and design better games to make it an attractive product at something like fifty dollars. New ideas were needed and thewy could not require a significant increase in the Bill-of-Materials. Herb Campman came to the rescue: "I can make Bill Rush available for a few weeks, if you want him. You know how creative he is. I don't have anything to do for him just now", Herb said. Bill Rush joined the project on July 18th, 1967. Within a few weeks, he came up with a novel idea that would dominate the video game industry for more than a decade: a third, machine-controlled spot, or screen symbol. This third spot could be used, for example, as a ball to play ball games. The first game mentioned in his notes on adding a machine-controlled spot was Ping-Pong. The team batted around ideas of how other games could be implemented. However, by September 1967, the TV Game project had started to put a dent into Herb Campman’s R&D budget. But now, games like Ping-Pong, Hockey, Soccer and Handball were born in a rapid succession, at least on paper. Herb Campman’s support continued. Then the project was stalled because Bill Harrison was called back for urgent duties on another, higher-priority program, and Bill Rusch went back to other tasks, too. But the team kept in touch in order to kick around new ideas. When Bill Harrison returned to work on the game project, he put Bill Rush’s third spot generator circuits to work, which Rush called Slicer Circuits. By early November, a fourth Unit was finished, and played Ping-Pong. Herb Campman visited the lab again and played the Ping-Pong game. "Seems to me, we're finally getting there! ", he said. "This looks like it’s for real". Thus, the project received another infusion of money, $8000 or so, which allowed the team to spend several months to improve Unit 4. It now played Ping-Pong, Hockey (the same game but without the central line), gun games and chase games. Rush’s spot generators were of a unique design. They used the nonlinear characteristic of silicon diodes to produce spots that could be nearly round, or have other amazing shapes like stars, ovals, etc. Although this was attractive, the design was unstable, meaning that the spots randomly drifted around, while slowly changing their shape. This was caused by thermal effects of the currents going through the diodes, and there was no simple solution to that problem. The older, rectangular spot generators had to be used instead.That made Bill Rush very unhappy which he eager enough to show. For Ralph, that subject was closed. A new objective now was to make the ball bounce off a player’s spot (say, a hockey stick) in the direction towards which it was propelled by the stick and with a speed corresponding to the velocity of the impact. Rusch came up with some paper designs and Bill Harrison started to build a fifth unit housing this circuitry. Talk about going after realism this early in the game! Since the analog circuitry required to accomplish such tricks requires signals that are the differential of another signal, the team dubbed these circuits "de/dt" (the differential of a voltage e with respect to time t, from basic calculus). It was all Rusch at his best. However, completion of the de/dt prototype chassis was postponed by Ralph Baer for time constraint reasons. Finding a licensee for the basic ball and paddle games was the major objective now. Building ever better games had to move to the backburner. Ralph’s main concern was how Sanders would get a return on their investment. Sanders being a high-tech, defense-electronics firm, the idea of Sanders manufacturing and distributing TV Games was unrealistic to begin with. An outside lincensee was clearly needed. The problem of what to do business-wise had remained unresolved for months, during which the management kept asking the engineers repeatedly where they thought they were heading. In response, Ralph’s first approach was that TV Games might be of interest to the nascent Cable TV industry. The CATV industry was not doing well at the time. Ralph thought his TV Games might just help it attract new subscribers and turn business around. Technically speaking, the concept was simple: The cable company would provide colorful backgrounds for the games and the TV Game Unit would create the action. Any cable station could easily transmit the bird’s-eye view of a tennis court complete with spectator stands, all in living color; all they needed to do was point a color camera at a poster that displayed the desired graphics. The white player-spots and the ball-spot could then be superimposed electronically on this colorful, complex background by the TV game unit and the result would be a rich-looking screen presentation. Towards the end of 1967, several new circuits were added to Unit #4, which would allow it to work synchronously with a cable signal. For demonstration purposes, the cable signal was emulated by pointing a small video camera at a set of flipcharts sitting on an easel. By November of 1967, everything was working like a charm. Ralph decided to call the TelePrompter Corporation in New York, then the largest cable company in the U.S. Eventually, he got through to Hubert Schlafly, a senior VP at TelePrompter. He got interested enough in the possibilities of cable games to set a date for a visit to Sanders, the 18th of January, 1968. During that demonstration the team played every game against suitable faux-cable backgrounds provided by the camera, emulating the signals coming down the cable. Mr. Schlafly was sufficiently impressed to persuade Irving Kahn, TelePrompter’s President (and "Mr. Cable" to the industry at the time) to come up to New Hampshire and get a similar demonstration, which he did on the 13th of February. Mr. Kahn also liked what he saw. The scene appeared to be set to move into cable games in cooperation with the largest cable outfit anywhere... progress on the business front! Thereafter, Ralph Baer made several trips to New York City to the TelePrompter headquarters to participate in developing a plan of action for the two companies; Sanders Corporate Director of Patents, Lou Etlinger, and Irving Kahn began to negotiate an agreement based on Ralph’s detailed, multi-page presentation of who would do what and when. In mid April, Ralph went to New York to work on the agreement with his counterparts at T.P. This time he took Unit 4 with him to give a demo to various TP and Manhattan Cable personnel. Everyone seemed impressed. Ralph’s team had hoped that cable games would prove to be a suitable medium for TV gaming; unfortunately, all of the U.S. cable TV companies (including TelePrompter) were in the midst of cash-flow problems; their difficulties paralleled those of the general business conditions of the late 1960s and early 1970s. Recession had hit Sanders also where employment went from some 11,000 employees down to barely 4,000 during that period. Unfortunately, the cable business got worse and worse, along with everything else. What was to have been a concerted, cooperative effort between Sanders and TelePrompter fizzled for lack of funding on their part, thus aborting the first attempt in the history of civilization to play interactive games over cable. Ralph and his team were back to square one, and desperately needed to find a new marketing solution for the TV game project. Some funding was still available. During December of 1967 and January of 1968, Bill Harrison used it to spend time on improving various games; he developed better-performing hardware and added new sports games. These included handball and volleyball—variations on the theme of Ping-Pong. Bill Harrison did most of the work. Ralph was busy managing the Equipment Design Division; he had barely enough time to stop by the small TV Game lab once or twice a day for a few minutes to confer with Bill and keep the effort on track. At the same time, Rush was busy working on a voluminous disclosure document describing his de/dt circuitry. Early in January of 1968, Herb Campman issued a Stop Order—shutting off all funding for TV game development—and all lab activity on games ceased for several months. Harrison went to work somewhere else in my division; Rusch returned to Campman’s R&D domain, although the three men remained in touch. In September of 1968, after an eight-month hiatus, Herb made some new money available and Ralph was able to get Bill Harrison back on board. At first, Bill worked some more on "cleaning up" various sub-circuits, such as the summer, coincidence detector and some of the de/dt circuitry. Then he began to concentrate on building still another "production" unit: TV Game Unit No.6. This one used a 3-position rotary switch to select the built-in games: Ping-Pong, Handball, Chase games, golf and gun games. The team was still unhappy with the design of bare-bones ball and paddle TV Game Unit#6. They recognized that additional, valid games could be played without adding many parts and cost. To accomplish this required mostly the improvement of the game selection scheme. Bill immediately started on a new design, which used slide switches to select the specific circuit interconnections needed for a particular game. That method allowed playing ten legitimate games. Harrison got an early version of this slide-switch-programmable TV Game working by the middle of January (1968); This was Unit 7 in the series of eight TV game units the team had built over a two-year period. Bill had covered the aluminum chassis with brown, self-adhesive, wood-grain paper, to make it look less chintzy. He had previously used the same paper on the hand controllers atttached to Unit 6. The new unit was promptly dubbed the "Brown Box". Bill also improved the operation of the good-looking, target-shooting gun used with Unit 6. The Brown Box was "programmed" by inserting cards between its two rows of switches. Dots on the cards indicated which switch to move for a given game. Later, Bill built another unit (Unit 8) which could be plugged to the Brown Box in order to add the dynamic motion (de/dt) effects to the games. All the hardware was working well now. Still, no marketting solution had been found. Eventually Ralph came to realize that a Home TV Game product might be the natural province of television set manufacturers. He repeatedly conferred with Lou Etlinger, who started the ball rolling by calling and inviting representatives of various U.S. television set manufacturers to come for demonstrations. RCA engineers and marketing people were the first to visit Sanders. They came in the middle of January of 1969 and were followed over the next few months by Zenith, Sylvania, GE, Motorola, and Magnavox, all of them substantial U.S. TV set manufacturers at that time. Warwick—Sears Roebuck’s TV set suppliers—expressed interest but told the team to contact a particular individual at Sears who expressed little interest in anything else than his exploits…a wasted trip to Chicago. GE suggested a visit to their small-color-set assembly operation in Virginia and demonstrate the Brown Box there; Lou and Ralph did just that in May, but again, nothing else came of that trip. The reaction to the various demos of the Brown Box and its accessories was uniformly positive: Everyone agreed that playing games on a home TV set was an interesting concept that had "legs." But only RCA proceeded to negotiate a licensing agreement with Lou Etlinger. That began in the spring of 1969. After months of working on the details of the agreement these negotiations also fell apart. The next section covers the story of how the Magnavox Odyssey system came into being after the collapse of the RCA license agreement. Click here for more information. "The present invention pertains to an apparatus [and method], in conjunction with monochrome and color television receivers, for the generation, display, manipulation, and use of symbols or geometric figures upon the screen of the television receivers for the purpose of [training simulation, for] playing games [and for engaging in other activities] by one or more participants. The invention comprises in one embodiment a control unit, an apparatus connecting the control unit to the television receiver and in some applications a television screen overlay mask utilized in conjunction with a standard television receiver. The control unit includes the control, circuitry, switches and other electronic circuitry for the generation, manipulation and control of video signals which are to be displayed on the television screen. The connecting apparatus selectively couples the video signals to the receiver antenna terminals thereby using existing electronic circuits within the receiver to process and display the signals generated by the control unit in a first state of the coupling apparatus and to receive broadcast television signals in a second state of the coupling apparatus. An overlay mask which may be removably attached to the television screen may determine the nature of the game to be played or the training simulated. Control units may be provided for each of the participants. Alternatively, games [training simulations and other activities] may be carried out in conjunction with background and other pictorial information originated in the television receiver by commercial TV, closed-circuit TV or a CATV station." (C) Copyright 1996-2018 by David Winter. Any reproduction, even partial, is strictly prohibited without permission.